How to hire the right entertainer for your event! 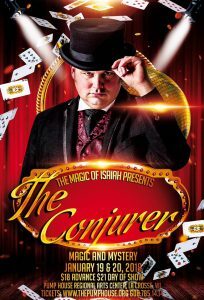 The Conjurer is a ninety-minute magic show that will give the audience a taste of the golden age of magic with a modern flare. This interactive show will immerse the audience in an early 19th century experience that is sure to leave the audience wanting more. The only requirement for this show is your imagination. The show is designed for ages 10 years and older.